Inspired by The Negotiation Challenge, a leading annual student negotiation competition, this book includes 16 ready-to-use, competition-tested negotiation roleplay simulations with thorough instructional debriefs that suggest both optimal strategies and discuss potential results. The main objective of this book is to help potential participants, their negotiation professors and coaches prepare for and prevail in negotiation competitions. It is also well suited for negotiation instructors looking for new and proven teaching material or for anyone interested in practicing and improving their negotiation skills. 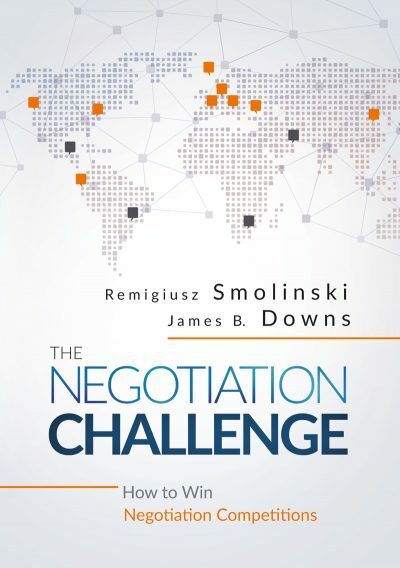 Following a brief introduction, chapter 2 describes The Negotiation Challenge as a competition. It explains how and why it started. It also describes its structure and discusses the evaluation criteria we use in an attempt to capture and measure what we term, negotiation intelligence. In this part of the book, we also give details on the competition’s admissions criteria that applicants need to fulfill to compete in The Negotiation Challenge. We conclude with facts and figures from past competitions including the list of hosting institutions and the winning teams. Chapter 3 is divided into four sections, each of which addresses a different type of negotiation. These include, distributive negotiation with value claiming strategies and tactics, integrative negotiation with value creation strategies and tactics, complex multi-issue negotiations, and multi-party negotiations. Importantly, each of these sections includes four supporting roleplay simulations, which negotiators can use to develop and reinforce their skills in preparation for The Negotiation Challenge or other negotiation competitions. Each of these 16 roleplays are carefully selected role simulations that were written for and used during a previous Negotiation Challenge championship. Purchase now and get a PDF copy immediately delivered to your email address. A PDF copy is less expensive and preparing student copies is easier with a PDF version of our book. Prof. Dr. Remigiusz Smolinski has been engaged in negotiation research and teaching at leading business schools and corporate executive programs for over a decade. He is also the founder of The Negotiation Challenge, an annual negotiation competition held between teams from the world’s leading universities and an advisor and judge in many other negotiation competitions worldwide. Dr. James B. Downs, MBA has over 20 years of sales, business development and management experience in the biopharmaceutical industry. He also produced and directed The Negotiation Challenge competition held in Leipzig, Germany. The Negotiation Challenge has an excellent track record of testing and building negotiation skills based on carefully designed roleplay simulation. The competition has provided hours of experience for negotiation educators to compare and analyze negotiator ability. This book is a great source of inspiration and tools for all negotiation professors and coaches looking for new teaching material for their negotiation courses and seminars — cases that target specific skills and challenges. My students regularly participate in 15-20 negotiation and mediation competitions per year. With its valuable advice and high quality negotiation simulations, this book helps me prepare the students to compete on the highest international level. Negotiation simulations have become an integral part of negotiation pedagogy and I regularly use The Negotiation Challenge simulations in my negotiation classes. They generate the desired learning effects and my students love them! As with great negotiations, the writing of this book has been a collaborative process. In this spirit of collaboration, we are always receptive to helpful feedback from readers on how to improve it. Thus, from the smallest spelling or grammar error that we have missed to your thoughts on improving its structure, please send your feedback to: book@thenegotiationchallenge.org.